Everyone’s drawn to this sublime looking -- and tasting -- cheese when it covers a hamburger. Its distinctive bold marbling makes even the most well-mannered turn their heads and rubberneck. Think of everything that you love about creamy, delicious, highly meltable jack cheese, and combine that with all that you appreciate in the wide world of blues, and you’ve got yourself Wisconsin’s flavorful, but never overbearing, marbled blue jack. It slices rather than crumbles and has a lovely mild blue flavor. Marbled blue jack is like a microcosm of the entire cheese universe all in one cheese. 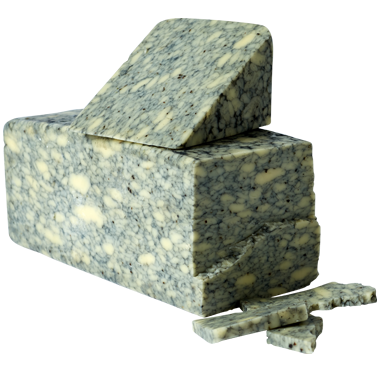 Easy to slice and easy to melt, marbled blue jack is a breeze in the kitchen, or anywhere else for that matter. We really like to melt it into dishes and snacks angling to spice up an otherwise dull party. The backbone of the blue in this cheese steers us toward punchier drinks and bolder ciders. If you’re drinking beer, then we recommend amber ales, Scotch or Belgian ales, bock, sour ales and fruit beers. We like bright, fruit-forward wines to partner with marbled blue jack -- think cabernet sauvignon, beaujolais and rosé. For stronger stuff, madeira, port, brandy, bourbon and a classic Old Fashioneds (with brandy, obviously, as any good Wisconsinite well knows) all pair well. There’s not a lot that you can’t do with marbled blue jack. We really like it on burgers and sandwiches that aspire to big flavors. It melts really well, so if you ever make savory pancakes (think whole grain flour, buttermilk and roasted veggies) grate it into those. You can also use it as an accent in macaroni and cheese and pasta dishes.